I coded this plugin to be as customisable and helpful for gym challengers as possible. Using the /gym list, Gym Challengers can Easily see what gym's are open and what the level cap of that gym is so they are not asking for ages in chat whilst the Gym leaders are busy. The plugin also enables Gym Challengers to know exactly which gym leaders are online so they know who to contact. This plugin stops your server's players getting pissed off with not knowing whether the gym is open or not. All the same can be done for the Elite 4! If they don't see the chat, not a problem... The Scoreboard makes it so challengers can see the open gym's to the right of there screen, useful for if they join the game after a broadcast or don't know any of the /gym commands. If they don't want the scoreboard there, also fine.. They can do /gym scoreboard to toggle it! Or, if your server already uses the scoreboard,you can completely disable it in the config. The plugin is heavily designed to stop unwanted chat spam of People saying "Is a rock gym leader online? Can he open the gym please???!" Trust me, I have herd it all. Not only does the plugin make everybody happy, it is crazy customisable. You can change almost everything you need, with a few minor flaws. 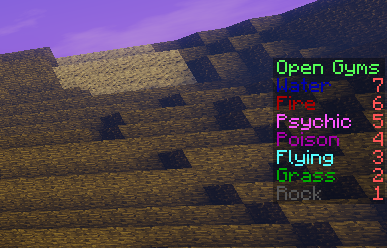 You can customise the Broadcast Prefix from the default "[PixelmonGym]" to anything you want. You can change names, enable, disable and totally customise all the 32 Gyms, change the colour of the broadcast message for each gym using colour codes, add 5 Gym rules per gym in the config, set up to 6 pixelmon per gym to give to a player automatically when setting them as a gym leader with /pixelgym addleader, set a gym badge ID that shows in the players badge showcase (/gym see (player)), totally customise the Elite 4, Set the level cap for the each gym, completely disable the scoreboard, disable or enable gym leader healing, and many more.